In this guide, we’ll look at five categories of great promotional email examples, and then show you the takeaways you’ll need to craft spellbinding emails your audience will love. Congratulations! Your just got a new email subscriber. Now it’s time to establish a relationship with them. And what is every great relationship built on? Trust. This should be one of your main goals when crafting your promotional emails. 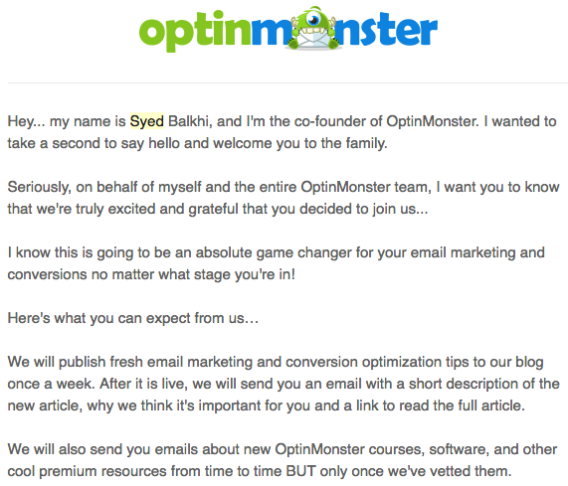 When you first sign up to OptinMonster’s newsletter, you receive a welcome email from “Syed from OptinMonster,” our co-founder. Using Syed’s first name adds a personal touch to the email that helps it sound less like it comes from an entity and more like it comes from a colleague. The tone of the email further supports this feeling by being cordial yet professional, as if it’s coming from a knowledgeable friend who is interested in helping you. Before diving into business, Syed takes time to personally thank the reader for subscribing, using phrases like “join us” and “welcome to the family” to establish this is not just a newsletter, but something bigger. And now, as a subscriber, the reader has become part of it. In the above screenshot, Syed promises three future gifts for his reader. And over the next three days, he delivers on them. Keeping this promise helps to establish trust and shows Syed’s readers what they’re getting from the relationship right from the start. First impressions are important, so it’s important your first email doesn’t put off your potential customers. Since you have a product, service, or content you’ve painstakingly created for them, offering your readers something of value should be easy to achieve. Simply offer discounts on your merchandise or services, or promote some of your great content. If you’ve got great content, flaunt it. 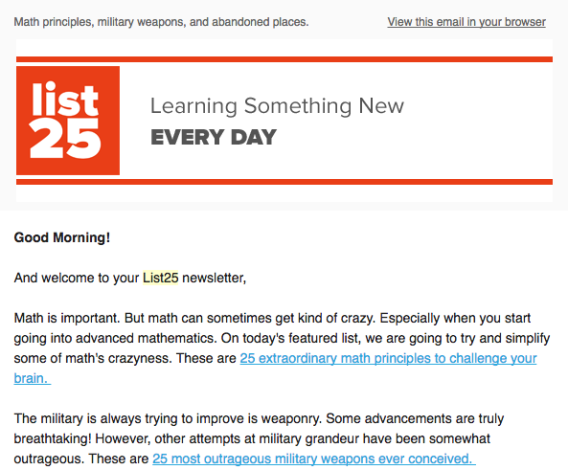 That’s what List25 does. Your email newsletter is a great opportunity for you to keep your readers up-to-date on with the content you’re producing. 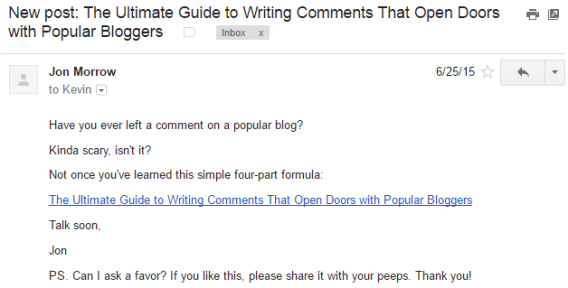 Provide a highlight reel and explain how these posts can help your readers. Of course, nothing entices readers more than getting a great deal. Offering your audience a valuable discount has the power to convert unsure readers into faithful customers. 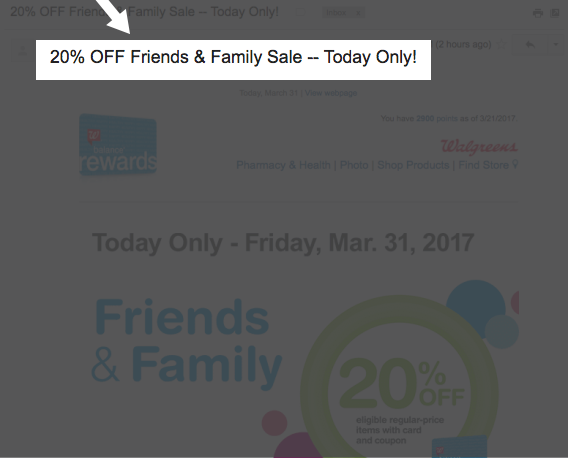 In the example above, Walgreens speaks to the bargain hunter in each of us by offering a 20% coupon. You have a limited number of characters to catch your reader’s attention and convince them to open your email, so make them count! Just because your audience has already shown interest in what you have to say by subscribing to your list, you can’t become complacent. With each new email you send, you need to recapture their attention and entice them to stay engaged with you. There are a few ways you can do this. In this example from Social Media Examiner, the problem the email promises to remedy can be found in the subject: improving the reader’s Facebook reach. Whether you’re selling a product, a service, or a blog post, titling your emails to address a specific need of your audience is a great way to grab their attention and convince them what’s inside your email is worth their time. The subject gives just enough information to pique the audience’s interest without giving away the whole story. If the reader wants to find out how to say goodbye to their lackluster Facebook reach, they’re going to have to open the email. If you’re offering your customer something valuable, highlighting the value in your email’s subject is a great way to get people to zero in on your email and pick it out of the dozens of other promotions they receive every day. 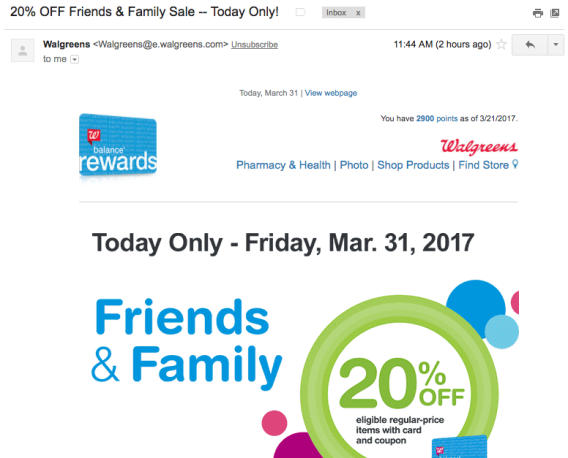 By using compelling phrasing like “Today Only,” Walgreens creates a sense of urgency and entices their readers to open their email right away or risk losing out on the deal. Walgreens knows how easily non-urgent “to-do” items can slip through the cracks and be forgotten, so they craft their subjects to encourage swift action. If your business relies on website traffic to generate sales, getting subscribers to merely open your emails is only half the battle. You need to get them to click the link in your email and visit your website. Jon Morrow takes a “less is more” approach to accomplish this task. …they see a wall of white space. Jon teases the problem the blog post will seek to resolve, and then he offers a link to click. There are no images, no distracting commentary, and no fluff. He doesn’t want anything distracting the reader from the task at hand: clicking that link. Depending on what you’re promoting, your audience will expect different things from your emails. It’s important to have a clear goal in mind for what sort of image you want to present, so that you can make sure it is clearly coming across in your emails. The one from Bath and Body Works stands in stark contrast to the one from OptinMonster; however, they are both incredibly effective for their particular audience. Bath and Body Works sales promotion email has bright colors, pretty pictures, and bold text. The company sells pretty, luxurious items with attractive packaging, and their emails reflect their customer’s desire for those types of products. OptinMonster by contrast is speaking to a different audience expecting professionalism and a business-savvy company they can trust. The company puts its best foot forward with simple, clean, text-heavy design that gets to the point. It’s important to ask yourself what you want your audience to feel and think when they think of your brand. If you want to create a feeling of luxury and opulence, images that support that kind of indulgence should be present in your email. If you want to create a feeling of professionalism and reliability, a more scaled back, simple, clean concept may be the best fit. But whatever method you choose, make sure you are consistent with your delivery. This will require a clear concept of what your company stands for and what kind of image you want to create. 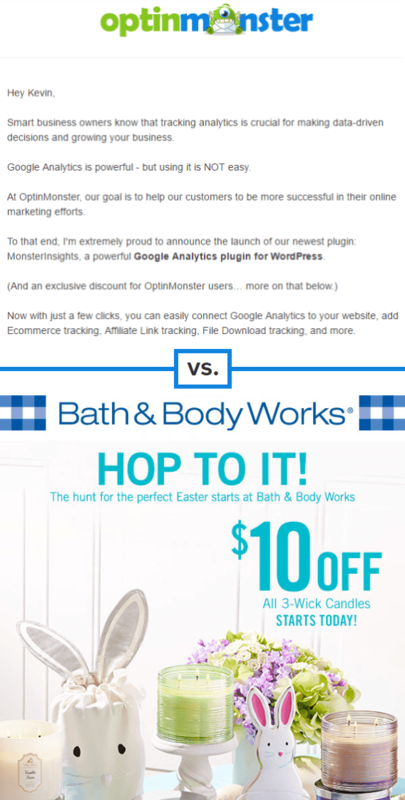 Though each email is different, every Bath and Body Works and OptinMonster email maintains a consistent vibe. Their customers know what to expect from email to email. Many readers skim emails looking for interesting and relevant information. If your email is difficult to read, disorganized, or doesn’t compel them to read further, your email is dead on arrival. IKEA’s email is easy to skim. It uses clear images, different colored text, and bold titles to break up sections. The main messages the company wants to get across are there front and center: the purpose of the promotion, the sale they’re advertising, and the prices they believe their customers want to see. Additional information is in smaller print in case the customer is interested in reading more information. What is given in the email is enough to pique the reader’s interest, while still leaving much to be explored on the company’s website. Call-to-action buttons instruct the reader to click through for more information. We’re not done just yet. If you have more to say than you have room in your email, avoid including attachments. Instead, mimic Syed in his OptinMonster welcome email and include a link to your website. This may seem obvious, but it bears mentioning: triple check your emails for spelling and grammar errors before sending them out. No matter your business, presenting yourself as professional and competent is important. There’s something eye catching about seeing your own name, so using your reader’s name in your email’s subject can help you get more clicks. However, use this tip with caution as it’s often used by spammers. Your goal of establishing trust should outweigh your goal of creating a catchy title. A misleading subject may lead to more clicks in the short term, but if you’re not delivering on your promises you’ll ruin the positive relationships you worked so hard to establish. Now you know the techniques successful businesses and marketers use in their promotional emails. But before you run off to write your next email masterpiece, we want to hear from you. Leave a comment below and tell us the best promotional email you’ve ever received (and what made it so great). When he isn't preaching the virtues of OptinMonster, Kevin J. Duncan is the Blog Editor for Jon Morrow's Smart Blogger. After reading your post I wanted to ask you a simple and straight question. I hope you gonna answer me. My question is based on open rate, currently, I am doing Email Marketing (sort of service marketing) but I am not getting leads through emails so can you tell me how can I approach my readers and secondly, my email going into a SPAM folder. I don’t know why my email going into SPAM folder particular in Gmail platform. No doubt your post is too wonderful and your guide is too good. I will be going to implement this technique which you mentioned in your post. Hi Rameez, we’re so happy that you found the post useful. 🙂 If you’re concerned about your emails going into recipients’ spam boxes, check out our tips on the reasons why emails end up in spam, and how to stop that from happening. Thank you for your guidance! About to send out our first promotional email so we’ll keep you posted! Thank you so much for these email templates. really it helps me too much. 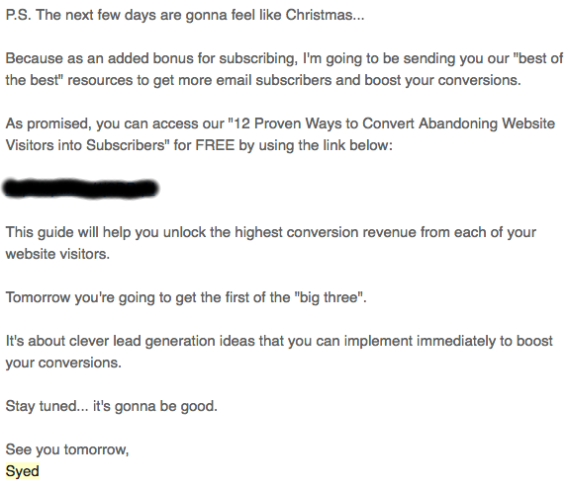 when I start my email marketing, I don’t know about the goals and techniques that should be used, but after I read your blog so, I’m so excited to start over again. In my website I used many apps to push e mails and pop ups that really is kick out visitors from my website because I don’t follow the goals that you discussed in this great article. thank you so much.